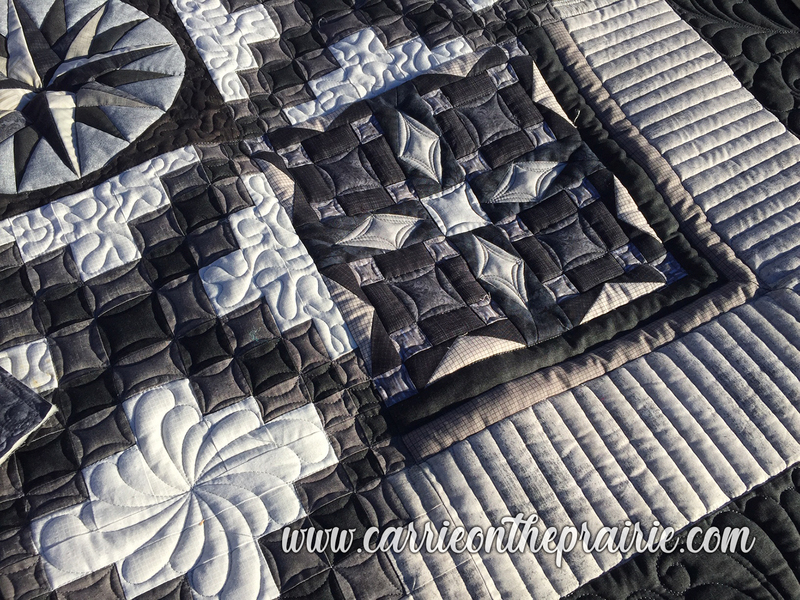 Here's the last quilt that I will post in 2018. That makes 152 quilts on my longarm in 2018. 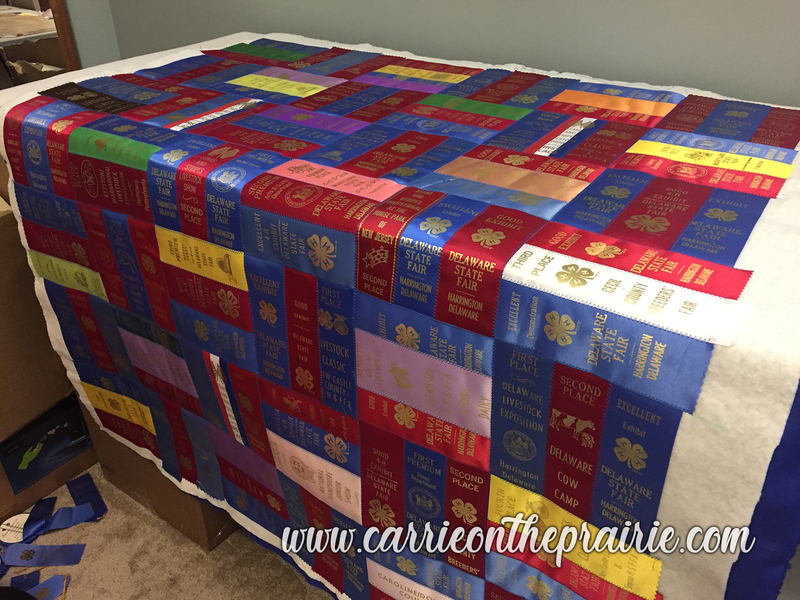 Incidentally, the EXACT same amount of quilts from 2017. A total of 470 since getting my longarm quilting machine in August 2015. 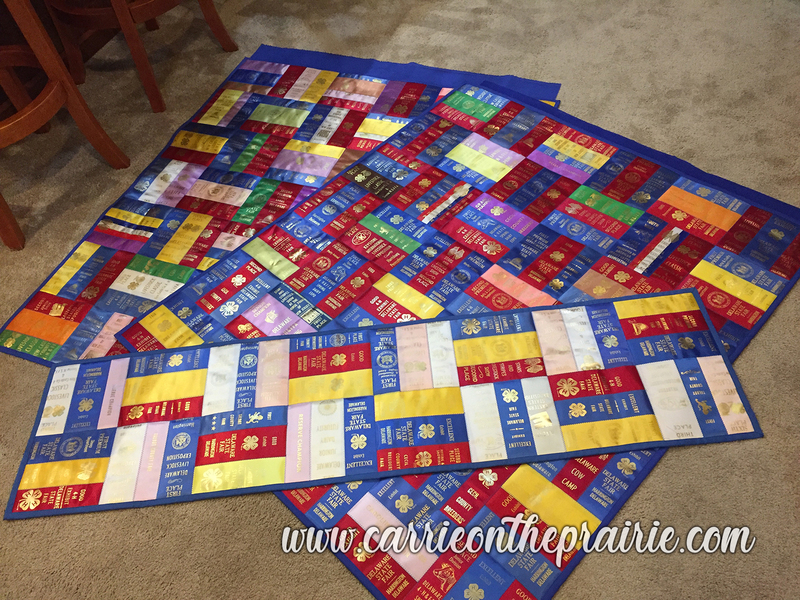 I'm having so much fun! 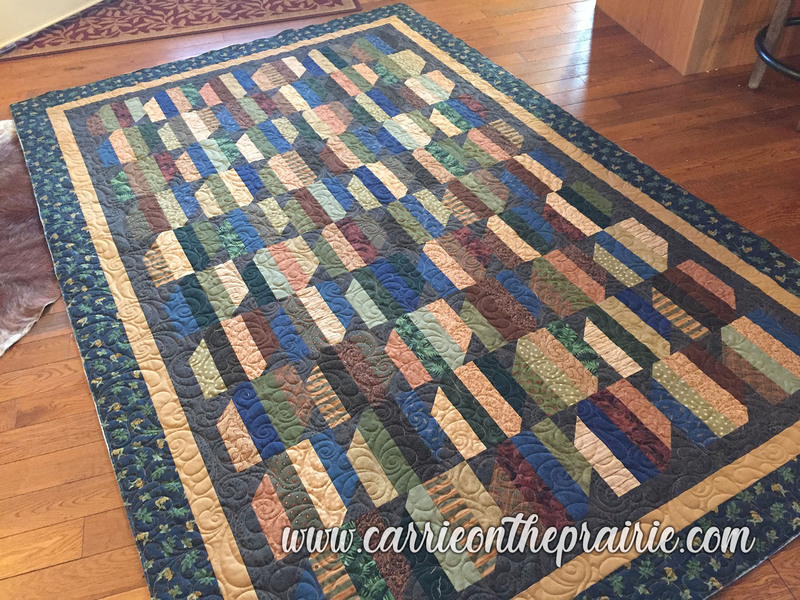 This was a block-of-the-month quilt by my client, Jennifer. 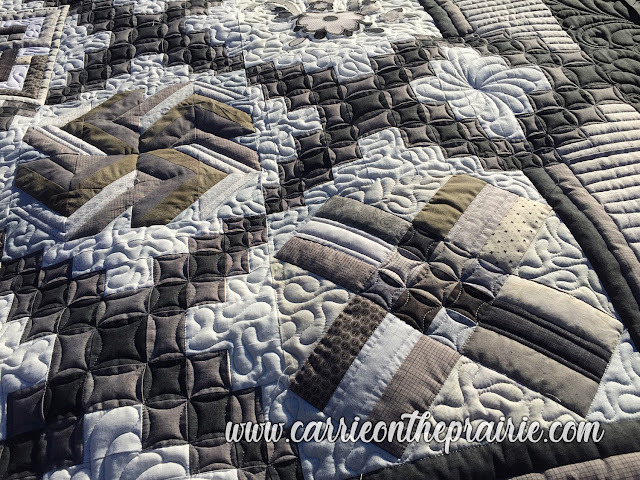 The subtle grays are so classy. 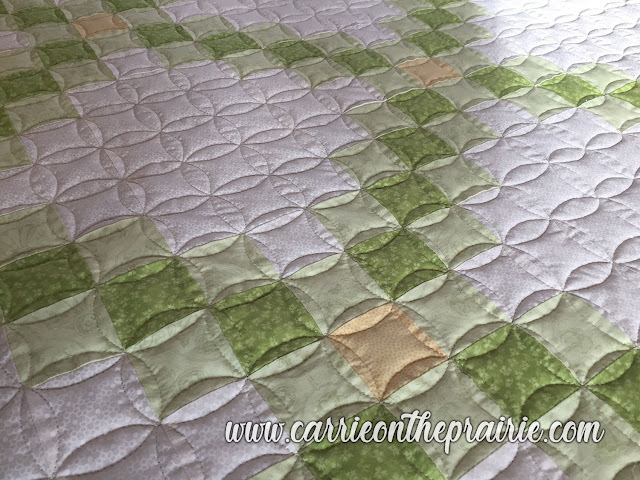 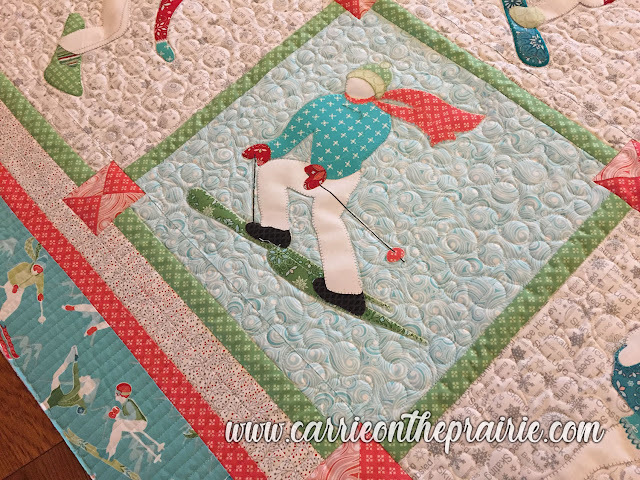 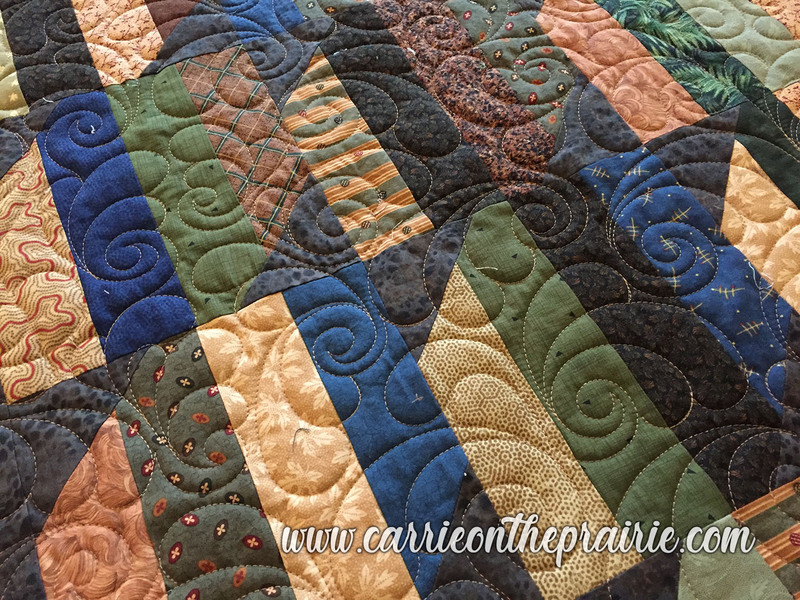 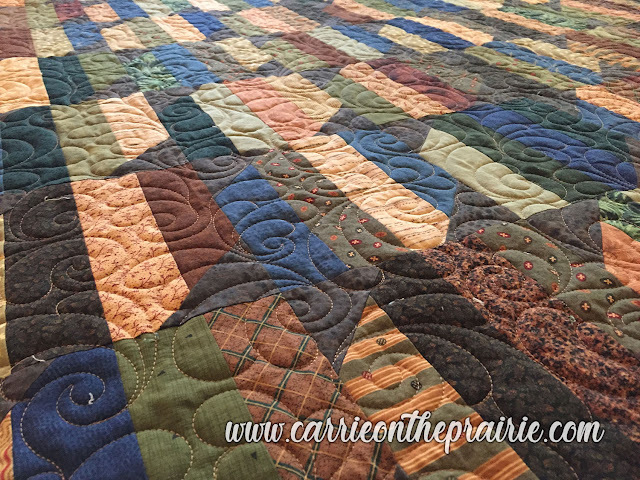 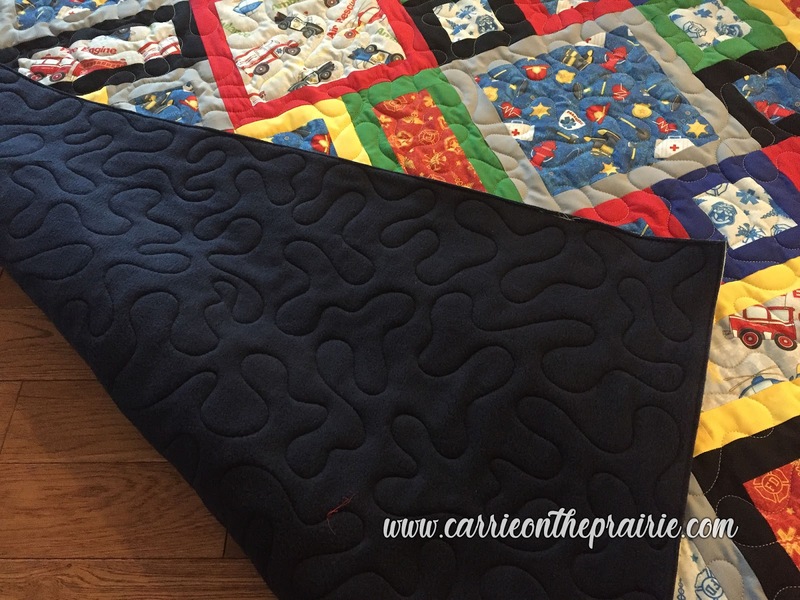 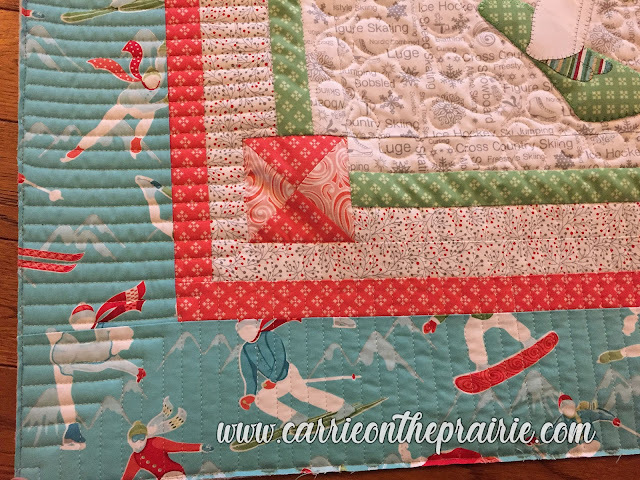 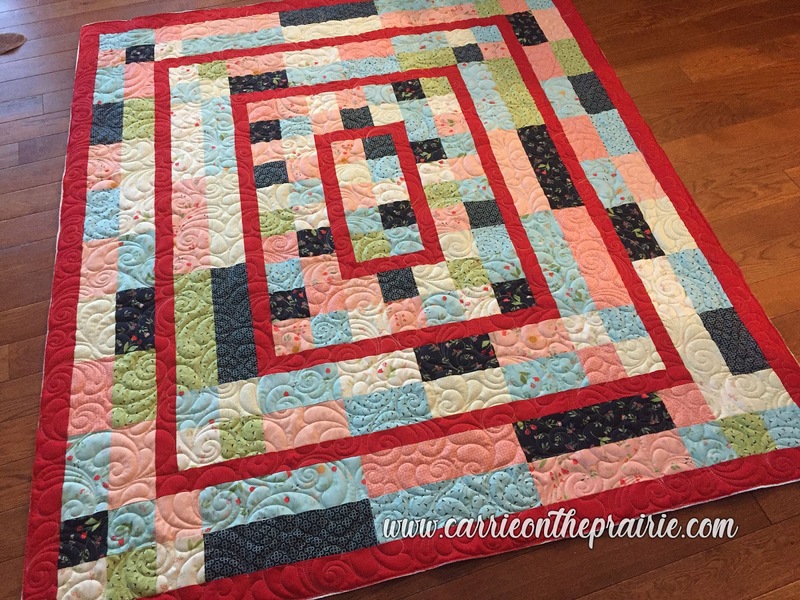 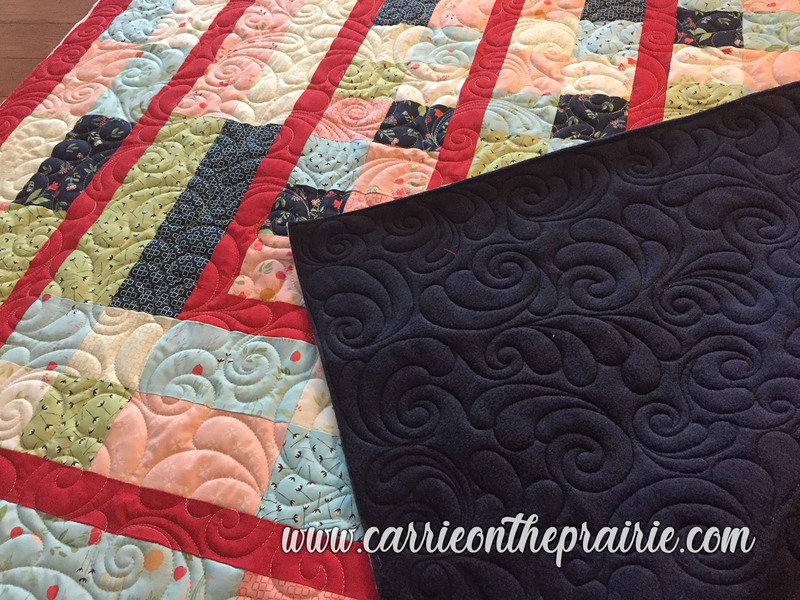 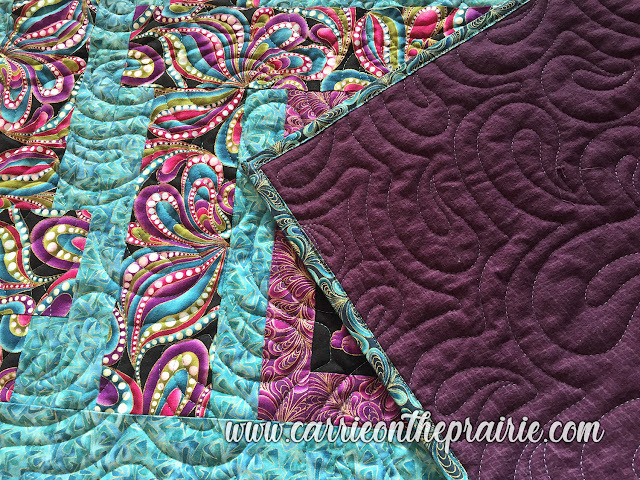 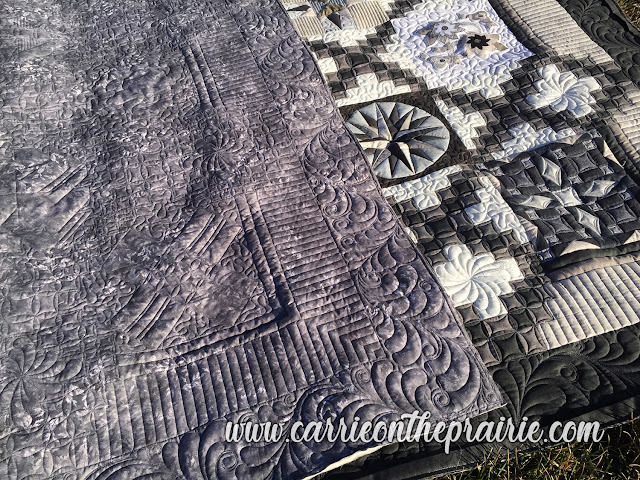 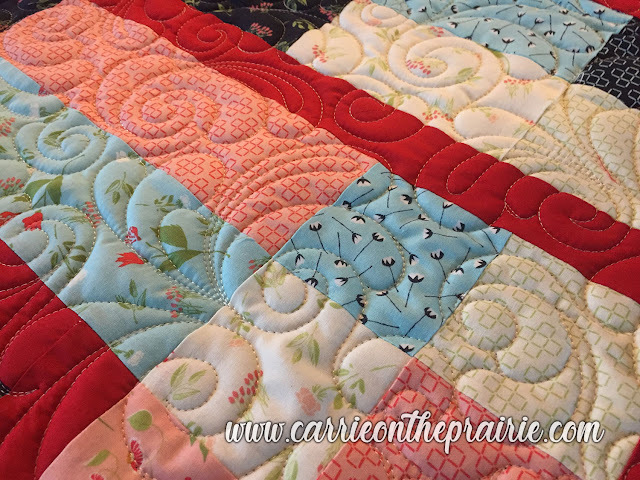 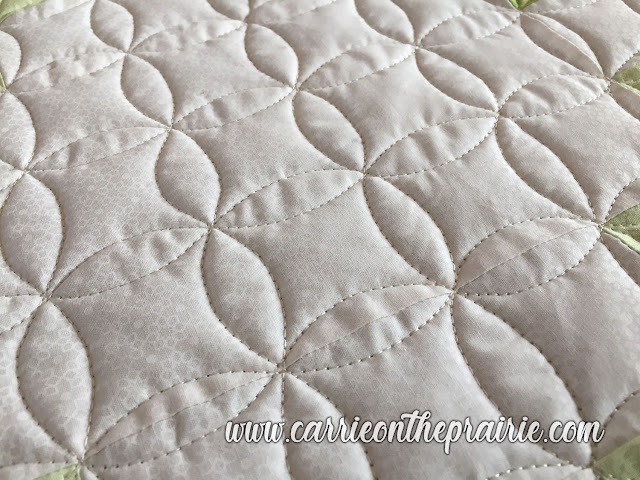 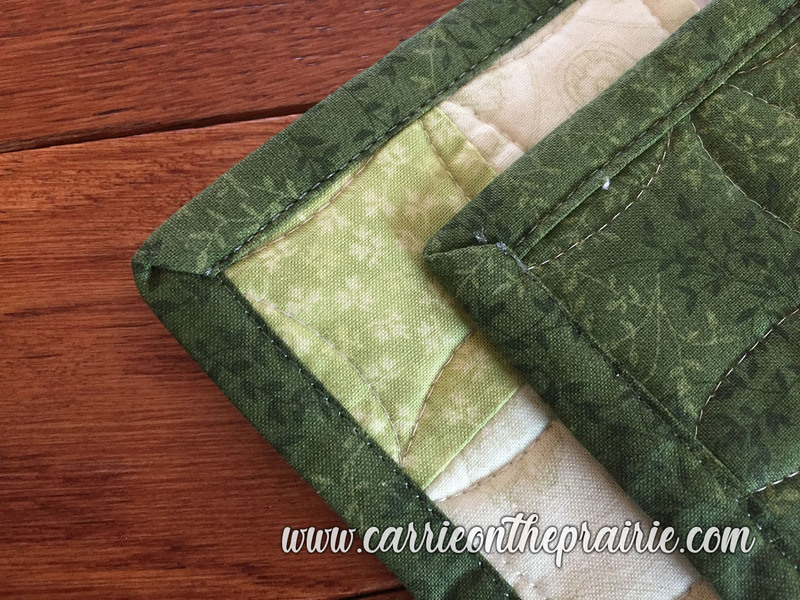 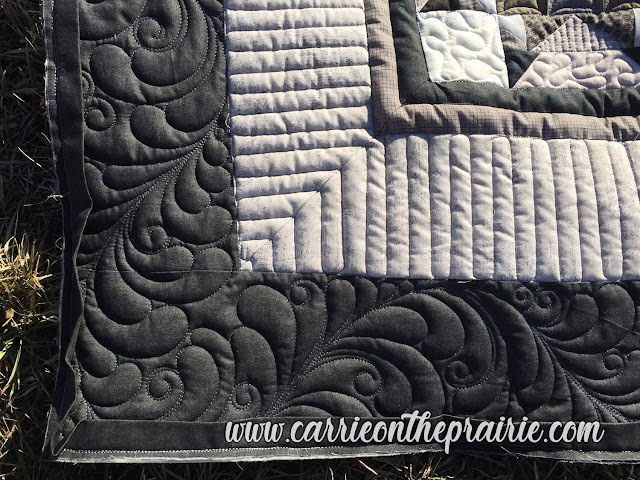 She wanted custom quilting, and each block was different, so each block got its own quilting treatment. 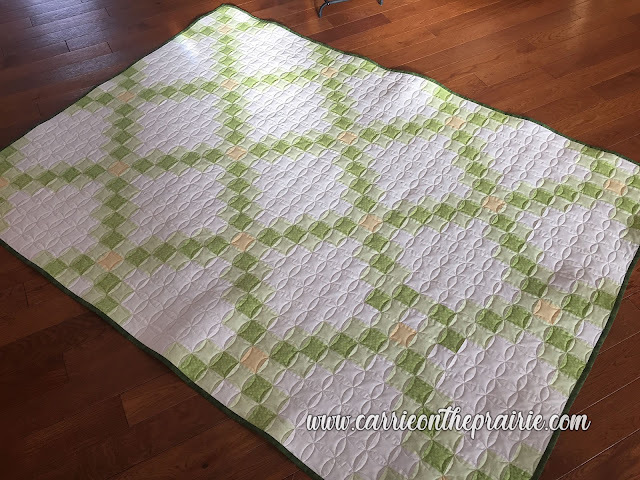 I think it turned out well! 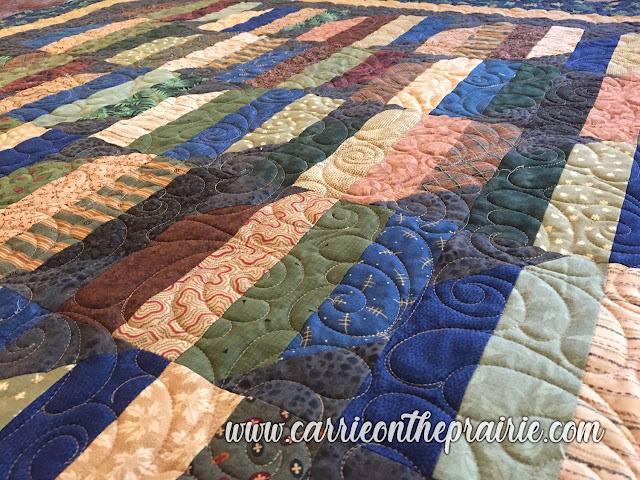 I just love doing these Ribbon Quilts. 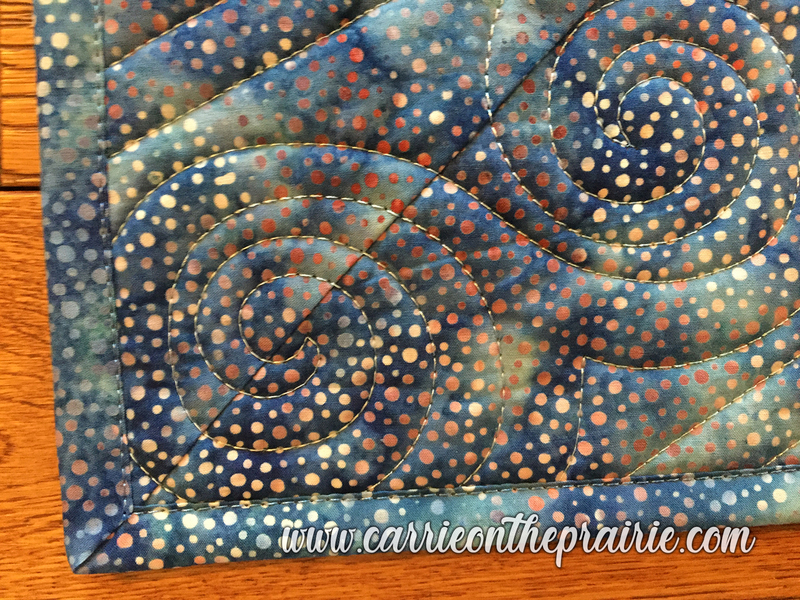 They are a total change-of-pace from my regular workload. For more information on the process, click here. 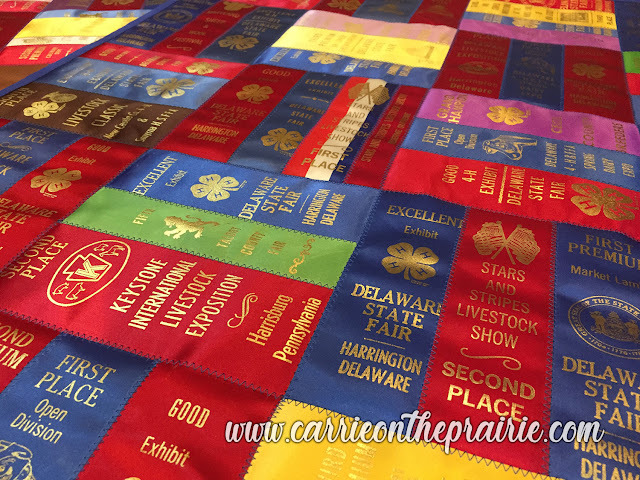 This order came to me all the way from Delaware. 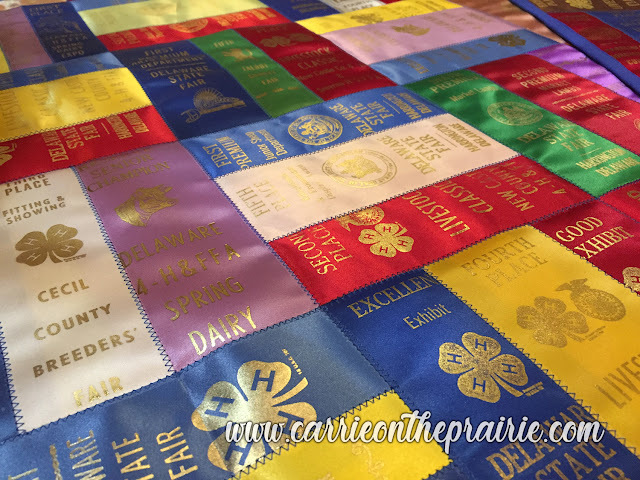 I love getting to interact with people from far and wide and imagine their lives, as I work with their award ribbons. These were earned by Robin's daughter throughout her livestock-showing career. 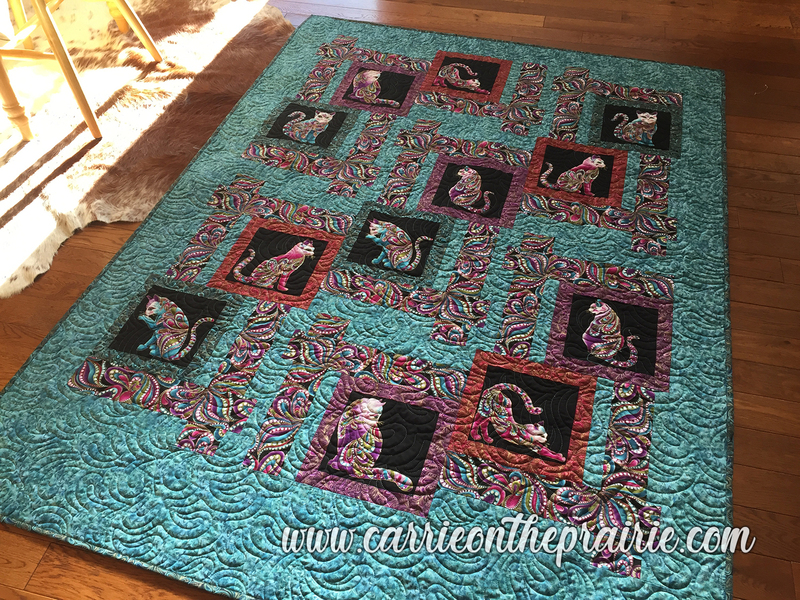 This was a quilt made by my client and friend, Jane, for her granddaughter (friend of my daughters), Sophie. 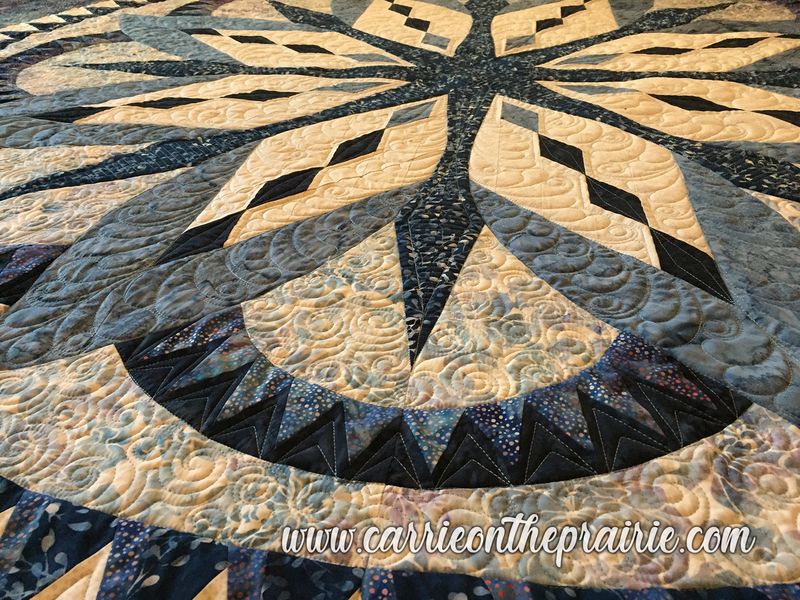 So, it was a special treat for me to work on. 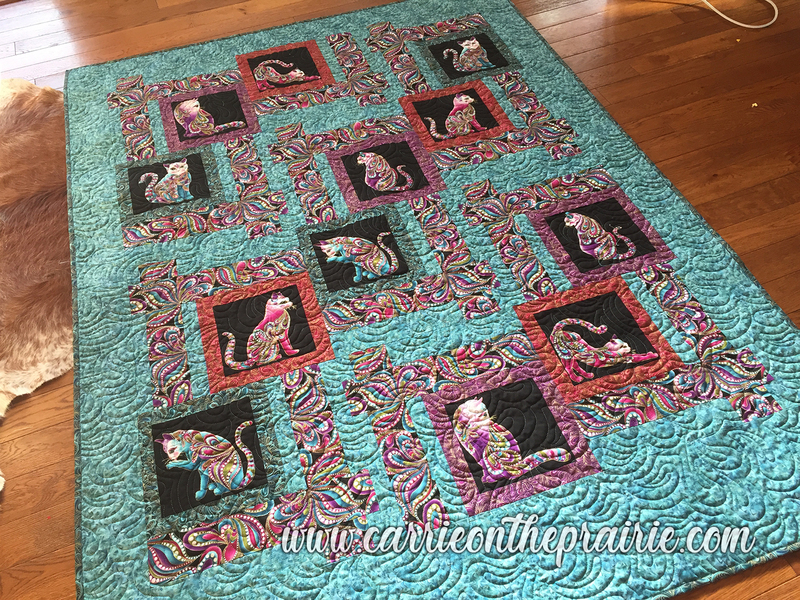 Sophie will love the cats in this piece. 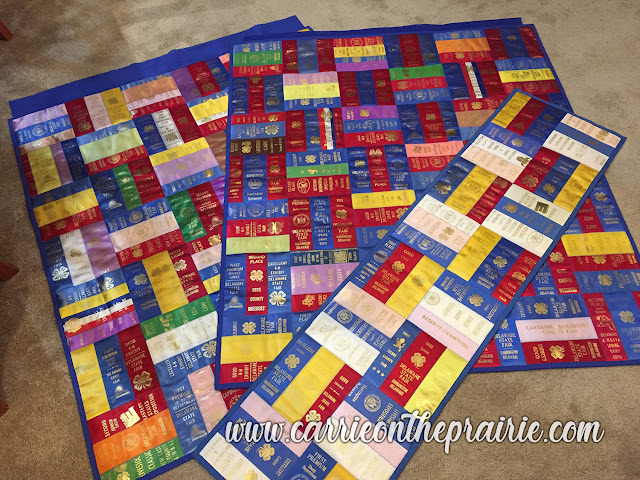 I know this, because MY girls loved them, too! 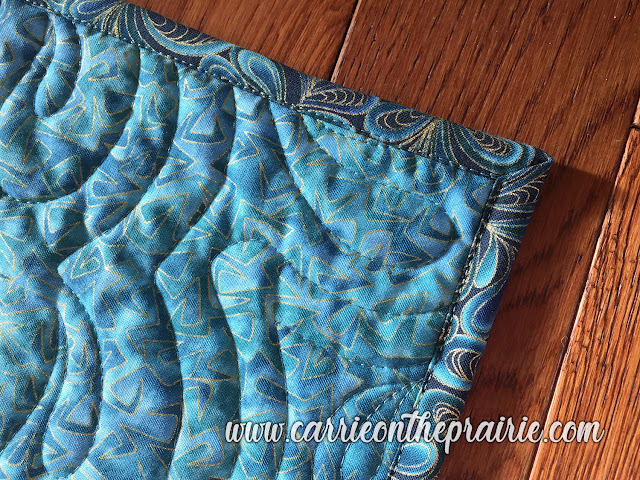 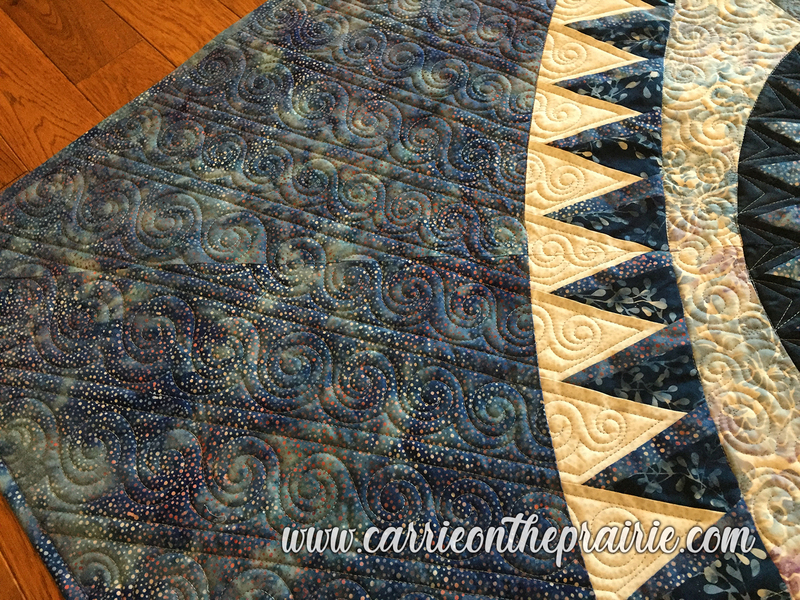 I quilted edge-to-edge paisleys, and applied my Effortless Binding. Ready for Sophie to love and enjoy! 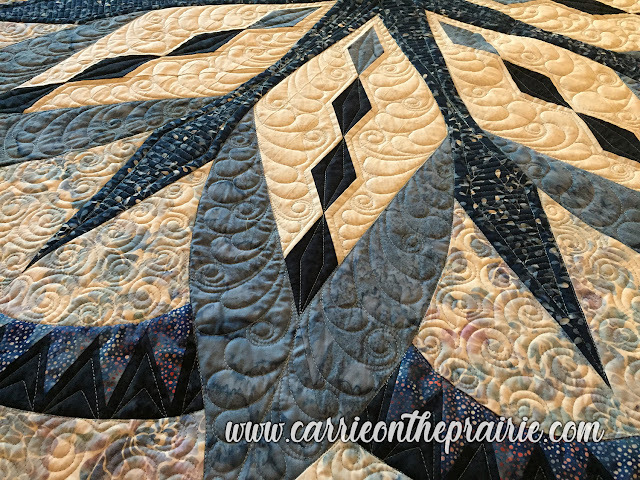 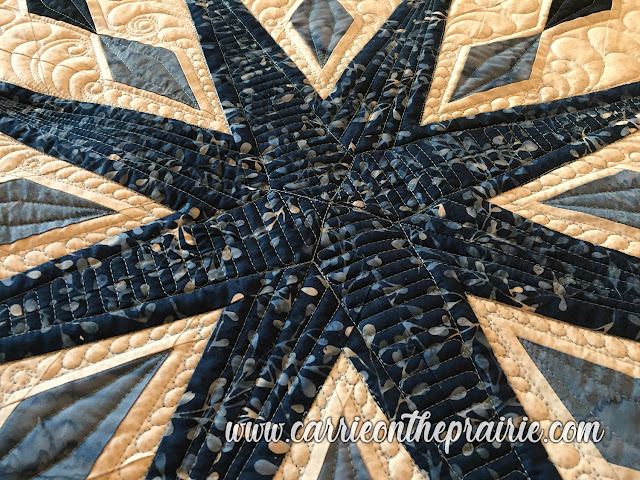 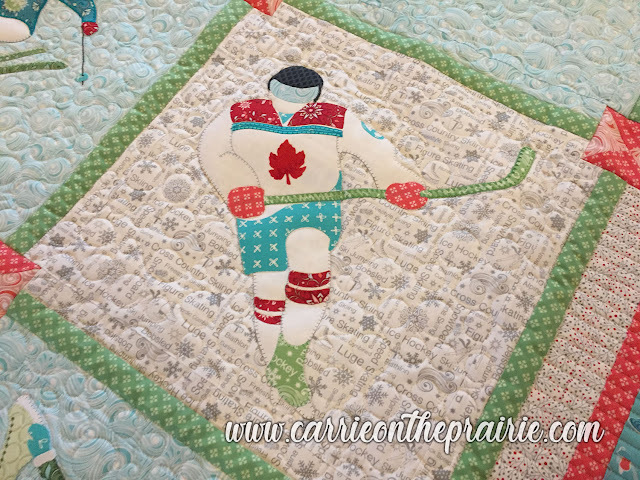 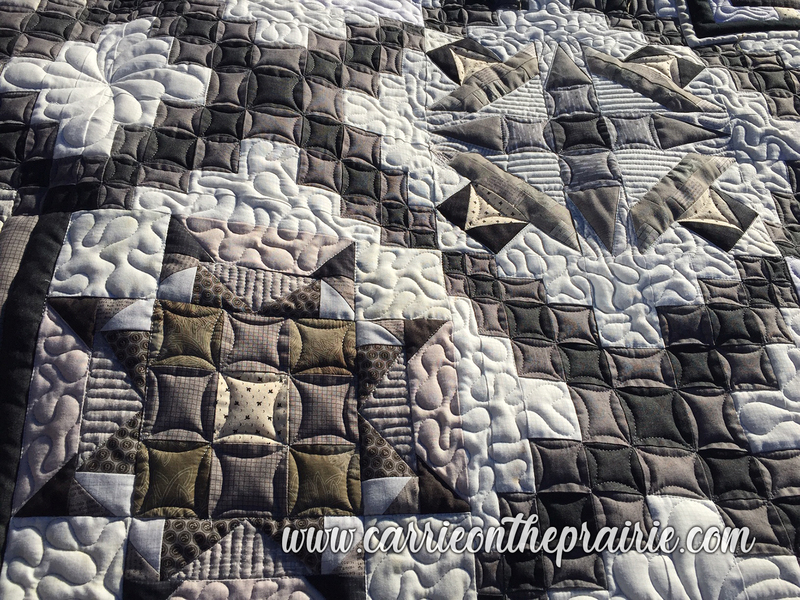 Lorna appliqued and pieced this quilt for Rumpled Quilt Skins in Okotoks, AB. It's a winter wonderland! A smorgasbord of snow sports! 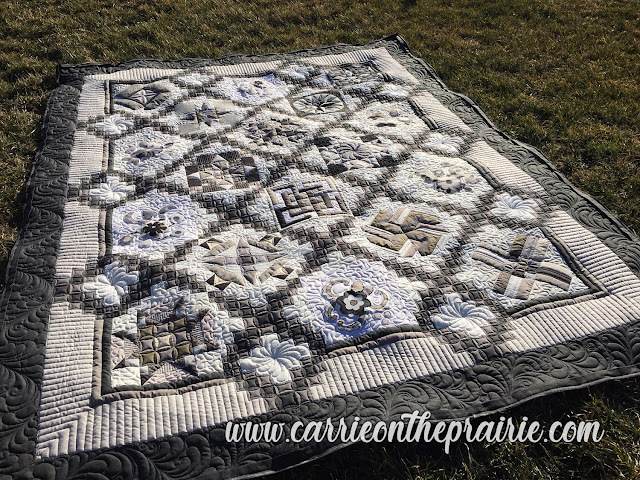 This is another homerun from Dorothy. 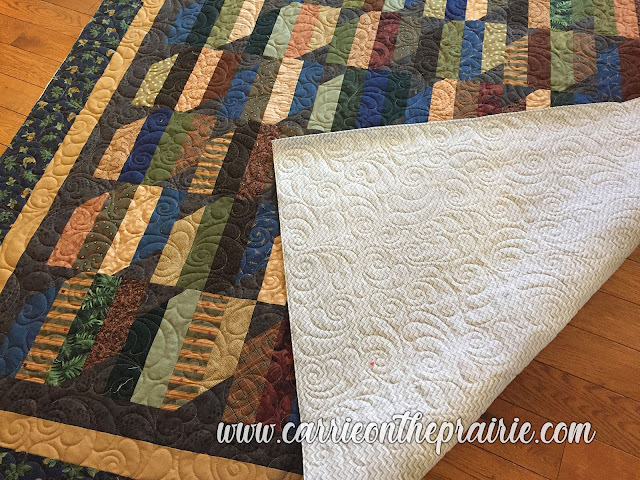 She always sends me the loveliest quilts to work on. 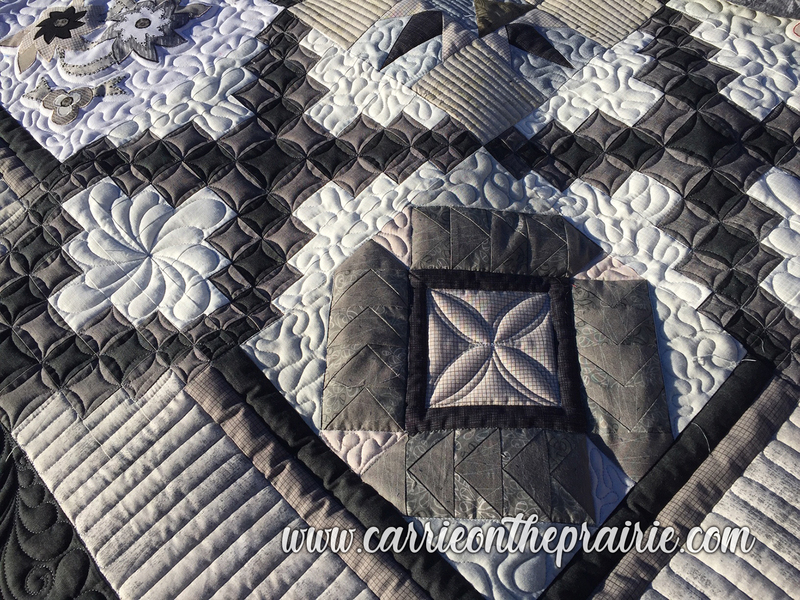 Expertly pieced, strait, and square. 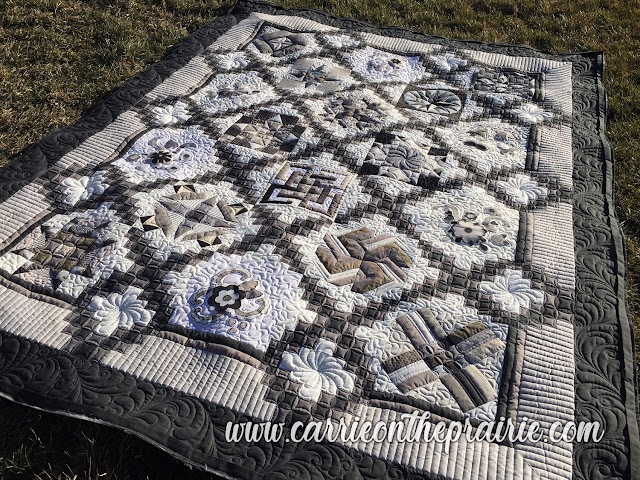 A pleasure for me to work on! 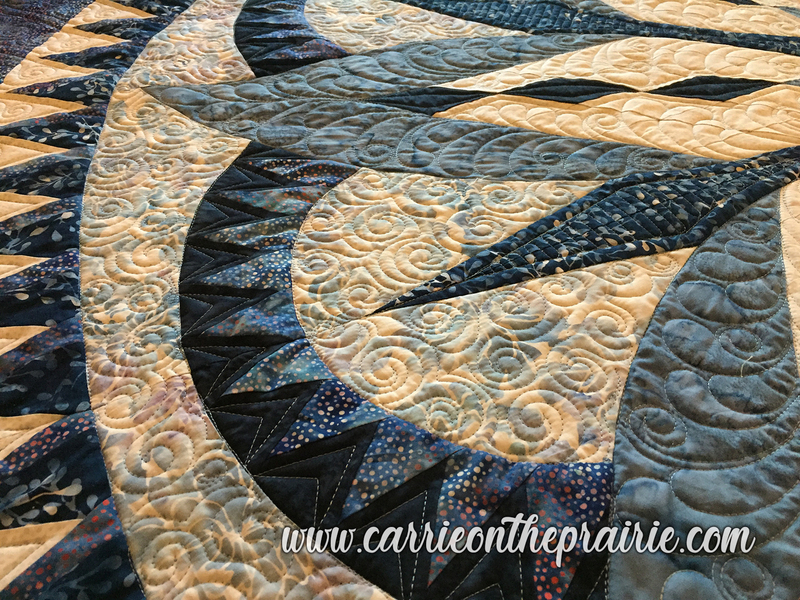 I applied edge-to-edge swirling feathers and shipped it back to her in Saskatchewan, via relay of friends on the road. 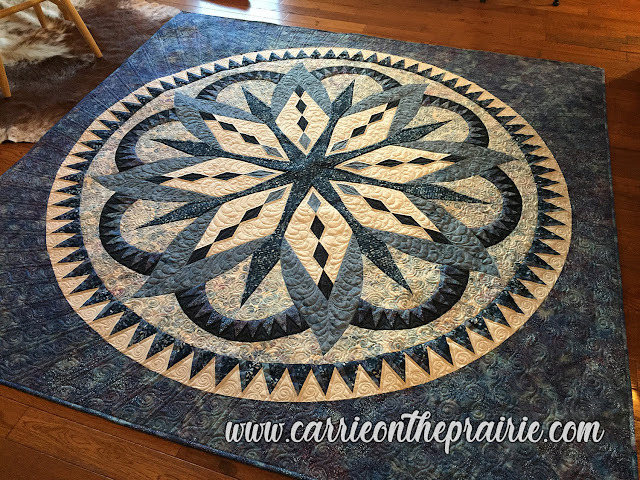 Look at this beautiful piece, by Brenda. 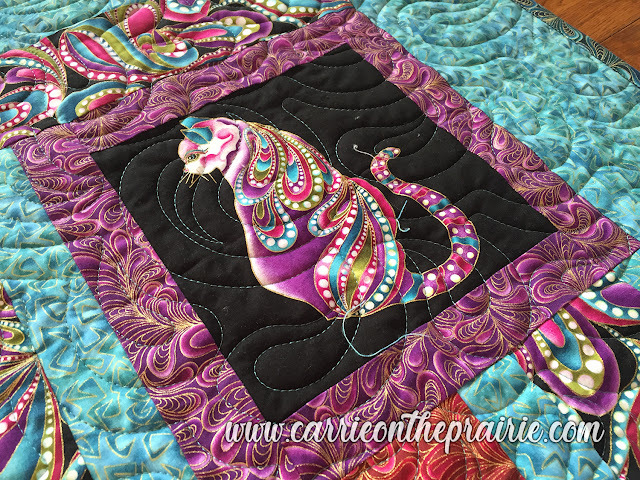 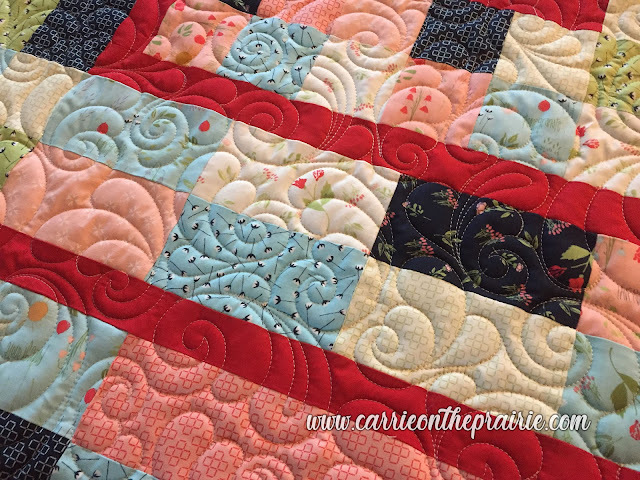 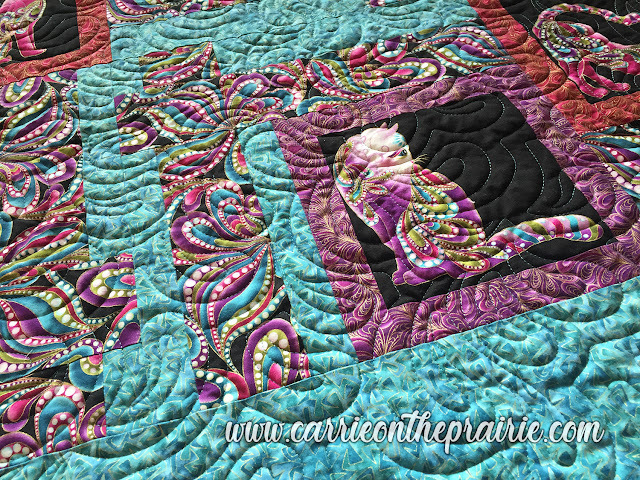 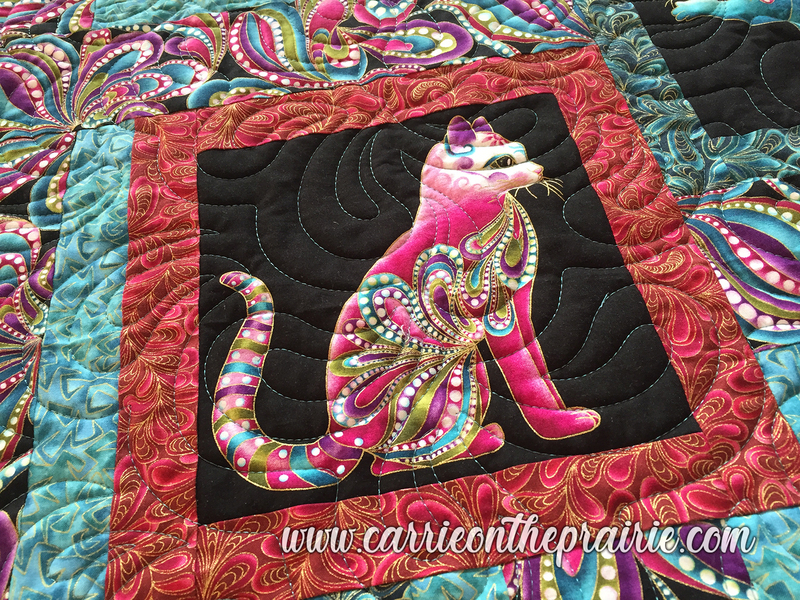 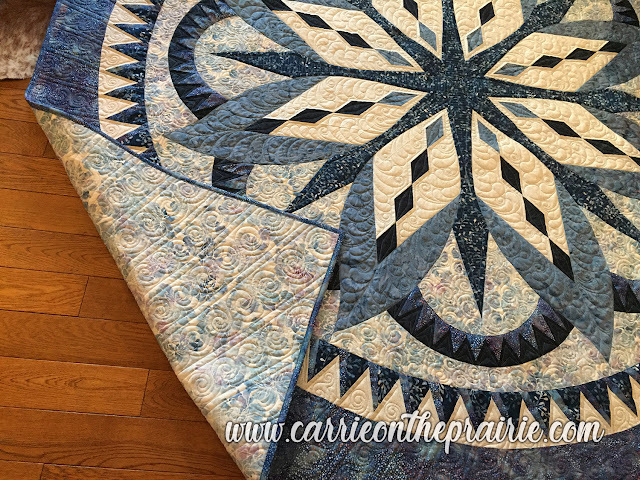 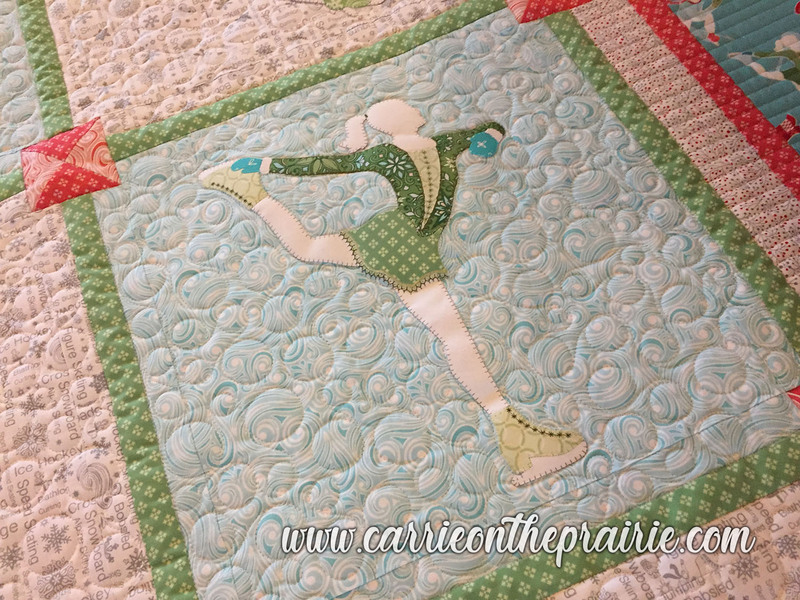 She's a relatively new quilter, and she's fearless! Look at the paper-piecing! 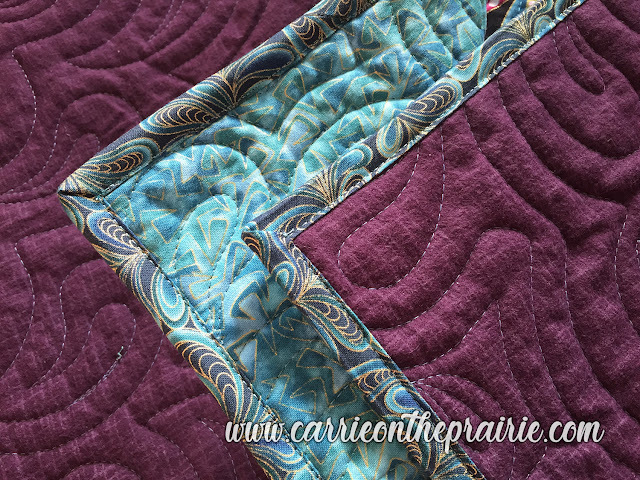 Look at the curved seams! 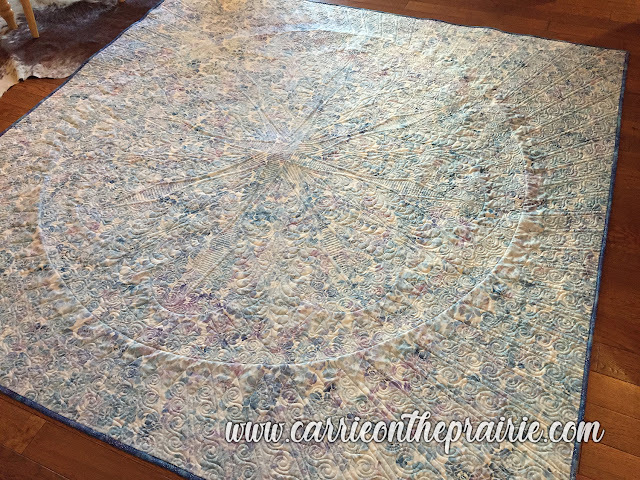 It's executed beautifully! 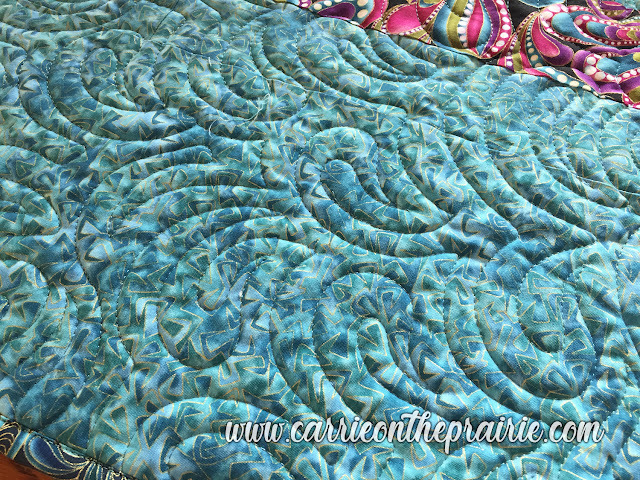 We agreed it needed custom quilting, which included feathers, channels, swirls, and ruler work. Great job, Brenda! 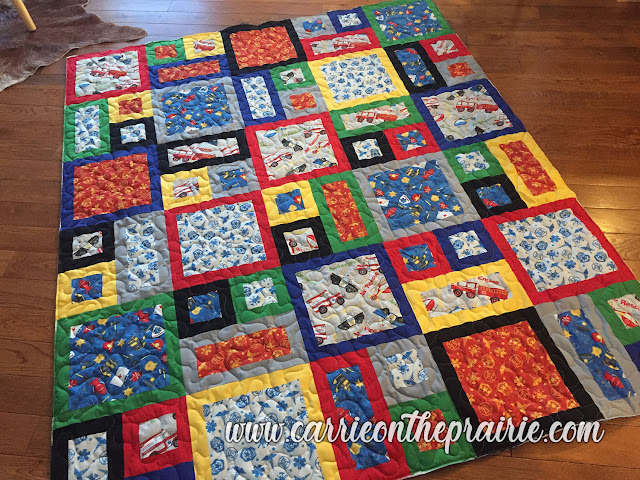 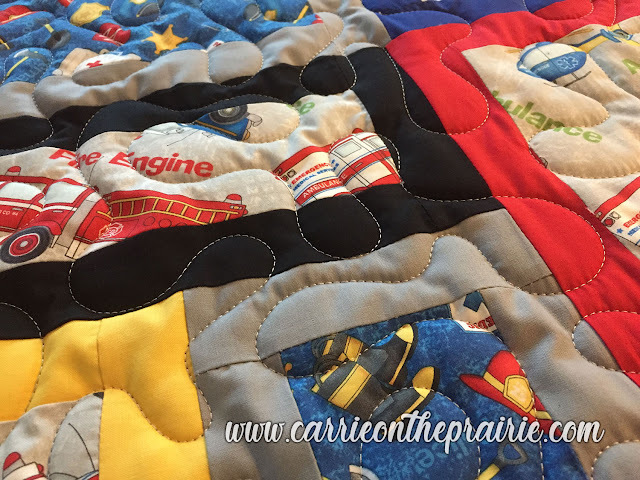 Leigh made this adorable quilt for a little boy in her life. 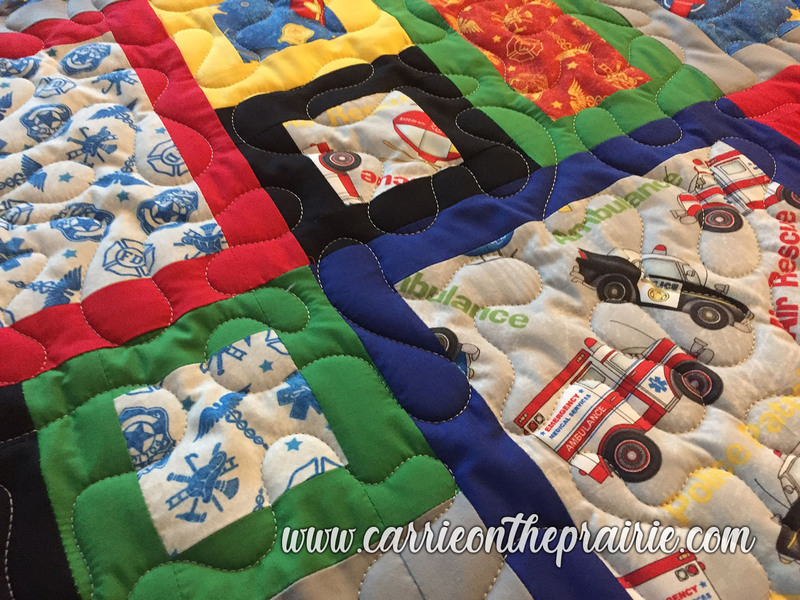 It's got firetrucks and police cars and ambulances and more! 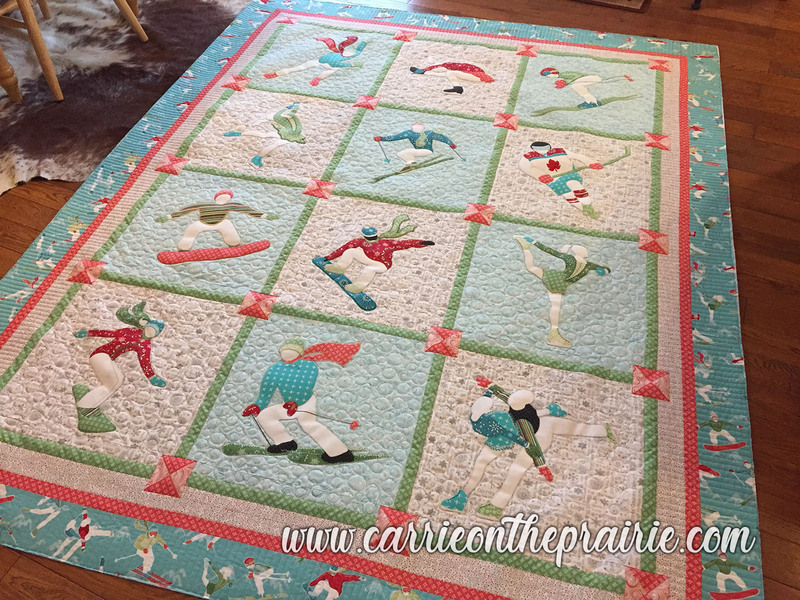 Great stuff for a little boy to dream of becoming. And with the fleece that she used for backing fabric, it will be so cuddly and warm! 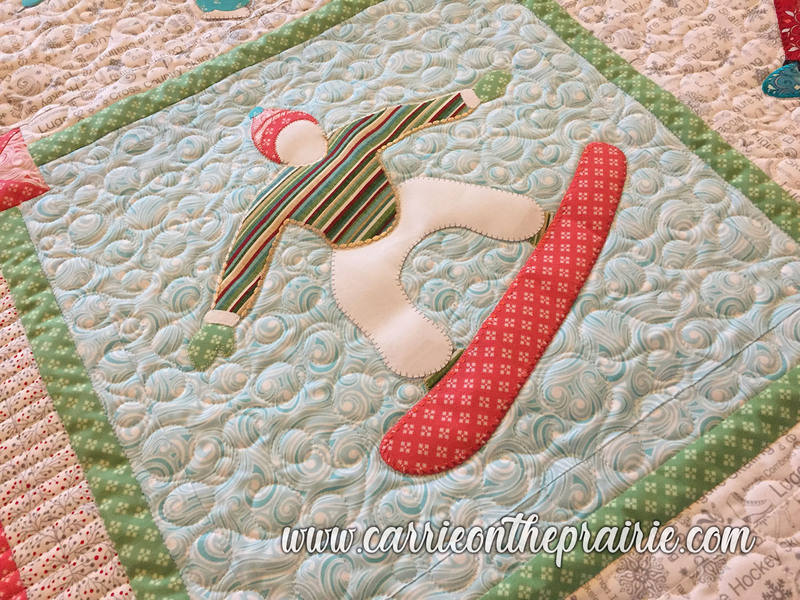 Sandra was busy as a bee, preparing for Christmas! Here two quilts that she let me quilt for her. 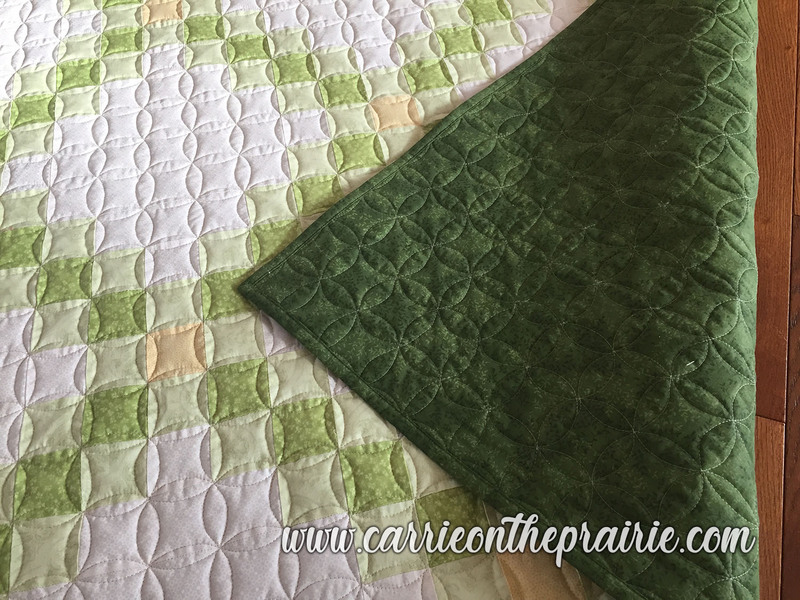 And the green one was the first to be gifted, so in the interest of time, she let me bind it for her, using my "Effortless Binding" service. So when she get it back, all she had to do was wrap it.